﻿ Embassy Hotel, San Francisco (CA) | FROM $110 - SAVE ON AGODA! Have a question for Embassy Hotel? "First off, the staff was great." "The room was spotless, cleaned daily with fresh towels and b..."
Designed for both business and leisure travel, Embassy Hotel is ideally situated in San Francisco Downtown; one of the city's most popular locales. The hotel lies 0 km from the city center and provides accessibility to important town facilities. Also within easy reach are New Conservatory Theater, Silver Lion Service - Private Tours, Mitchell Brothers O’Farrell Theater. 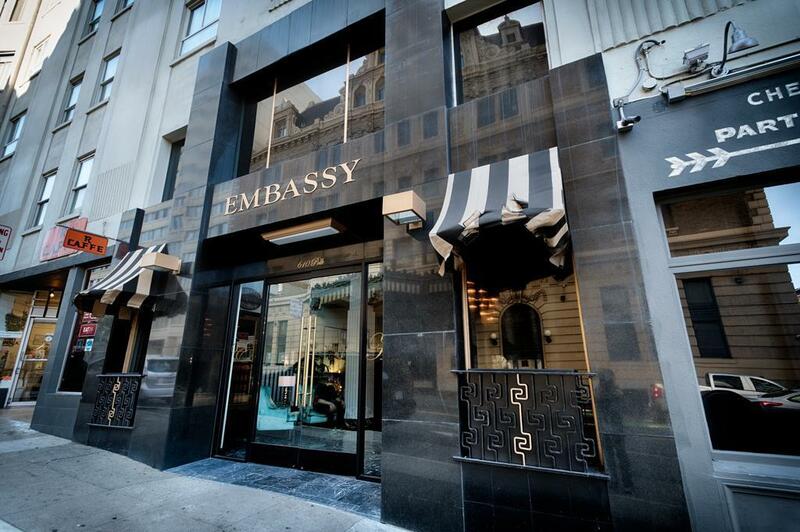 Embassy Hotel offers impeccable service and all the essential amenities to invigorate travelers. A selection of top-class facilities such as free Wi-Fi in all rooms, 24-hour security, daily housekeeping, 24-hour front desk, luggage storage can be enjoyed at the hotel. Embassy Hotel is home to 84 bedrooms. All are tastefully furnished and many even provide such comforts as television LCD/plasma screen, separate living room, internet access – wireless (complimentary), non smoking rooms, air conditioning. Besides, the hotel's host of recreational offerings ensures you have plenty to do during your stay. Enjoy unparalleled services and a truly prestigious address at the Embassy Hotel. "The staff is nice and helpful." Hotel is really good. If you are looking for a Quick travel & proximity to your locations, this hotel is really good. Would not provide all the facility which you are looking for but would be happy to stay for a week or so. I have spend 10 days here for my last trip & it was pretty good experience. If you are just taking Lyft or other and not caring about the homeless it's a great hotel. We wanted to go running from the hotel so it was not the spot for us. Staff is great. Wonderful espresso right next door...charming rooms. Hotel as well as personel are great, room was very clean and comfortable. The only one problem is location and tons of homeless people around the hotel. I've seen in my life lots of homeless people but these in San Fran are super crazy and addicted. If you decide to stay in this hotel you need to stay north of the hotel. The room was spotless, cleaned daily with fresh towels and bedding made. The staff were very friendly and helpful. Hotel is central to all public transport and all tourist sites are easy accessible by either foot or transport. Coffee shop was lovely also. I checked out of this hotel after waking up from a nap & finding one on the desk. The rooms are very dated, bedding uncomfortable, carpets filthy. This hotel is located in one of the unsafest neighborhoods in San Francisco. Expect to see homeless, crack addicts & prostitutes if you venture outside the hotel. Looked around all over SF and booked this hotel. The hotel was old and chic. Over all clean rooms and showers. Smelt muggy but that is due to the old ness. My experience was great and had no issues. I slept great and the shower felt very clean. First off, the staff was great. The room, not so much. It's outdated, no ac/heat, bathroom door would not close all the way, and the room smelled like an old thrift store. Luckily we were only here to sleep for about 8 hours. We decided to stay here cause it was walking distance to what we were doing in town. Bang for the buck is what you get. Overall, I'm satisfied. But I wouldn't go telling everyone to stay here. Too dirty! Not a place for human! Very cool old building, but the pipes in the shower do run a bit ho/cold while showering. The street noise was loud, but it was definitely quieter with the window closed. however there are no temperature controls in the room and no screen on the windows. Overall, funky, eclectic and I liked it. i was informed that there's no room available after arrival, and was asked to move to another place (oasis inn). the room is very bad, especially without air conditioner, also it's very noisy during might. i'm quite disappointed about this experience, and i do not recommend this irresponsible hotel for everyone! I spent little time in the room as I was a conference the better part of each day. The hotel was fairly close to the conference venue ( Moscone Center) , a 20 minute walk or a short cab ride away. The room was spacious enough for my needs. No frills but the room was clean and the bathroom had all the basics.I needed a place to freshen up and sleep. It fit my needs for a very reasonable price. The staff was very attentive and helpful. For the price, I was extremely satisfied. If I wanted luxury I would have stayed at a bigger and posher hotel, bu the Embassy Hoter suited my needs just fine. It was horrible. The room was tight with old furnitures, no space to walk. The car park is very limited. I had to park at another parking lots and paid for it. The elevator is very small and slow. The bathroom is very smelly. I got dirty towels. I would go to other hotel for this high price. This hotel is quite good for its location, its service and the fact that it has the free parking is very important. The breakfast was fair, not to reach but OK. The only two problems I faced was that in the room wood floor below the carpet there was a small hale that we need to take care not to step on, and the fact that the hot water in room was easily effected by the other guests in the hotel. It was fine. The hotel is located in the Tenderloin area of San Francisco with a lot of homeless, that said take a taxi at night to be on the safe side. The hotel is truly Art Deco in design and furnishings, very interesting. Brenda's Restaurant is located in the same block and has excellent French Creole food which is open breakfast-lunch-diner and is always busy. The excellent Noble Bar is located in the hotel. This hotel is an outstanding value for the money in the downtown. If you want to spend $500/night, stay at a five star Hilton, but if you want something uniquely interesting for a little money stay a the Embassy. I would go back. My friend and I stayed for one night to attend a concert in the city. The front desk clerk that checked us in was friendly and helpful. We stayed on the 6th floor, so we did not hear any music from the club attached to the hotel, that other travelers mentioned.